The latest thing of beauty I discovered about Ohio, with the help of a solid recommendation, is Alum Creek. If you are an avid bike rider, have tried difficult trails in the past, and most importantly, have access to a heavy-duty mountain bike, this trail will be a very good choice. Between two somewhat experienced riders there were only a couple of falls. So, before you embark on this journey, make sure to pack some neosporin. A good study of the map might come in handy as well as the biking task might seem a tad daunting towards the end. It might be helpful to picture the experience before actually doing it. One of the trails is a sheer 6-mile full of adventure and unexpected turns. The very last bike trail experience I had that was somewhat close to this one was in Little Cottonwood Canyon out West. I can say, at this point, that this trail was challenging, serpentine, and difficult. In other words, definitely worth a try or five. Overall, it's a fantastic experience and one which those of you who are visiting Ohio in the near future should see about experiencing. Plus, the Fall colors and the water formations around the trail inform the experience very well. YouTube has a good photo-journaling bit on it. Listen to the words of the narrator. I concur with him entirely. And here's some footage of the Upper Little Cottonwood Canyon Trail. If you find yourself in that neck of the woods, definitely try it too. It won't disappoint. WOW! This looks so good. What mntn bike wold be kosher for this? A first track ok? I have a pretty decent Specialized so that should be fine, right? I've got to try this. Read about it last summer but haven't gotten out there yet. Thanks. It's up by Delaware county, right? Was it really more challenging than Little Cottonwood? That footage looks pretty intense. 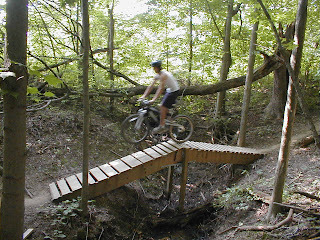 But then the guy on the first video does say that the Alum Creek trail is hard so I guess I'll have to give it a try. I remember Little Cottonwood being pretty tough. The one you just tried looks enticing. Wish I'd tagged along. By the way, what is the scrape count and who got the bigger number? It's cool that there are nice trails in Central Ohio. Were there many riders out there? Yeah, it's about 20 minutes north of Clintonville. Cool, cool spot. No, there weren't many people out there at all when we were. We saw maybe six other riders over the course of two hours. I saw a couple of great Specialized bikes out there and they sort of made me miss mine. But the Cannondale held its own. That's the kind of terrain that the steed of a bike is built for, for sure. Other people asked about the kind of bike to take out there and a solid mntn bike should do the trick. my bike needs to get some much needed breaking in, so this sounds like the place to do it. thx. I want to try Little Cottonwood. Summer the best time, right? Very cool. The Ohio trails look very green and beautiful. I haven't tried mountain biking yet, which is odd since I live in Utah, but then I have this little fear of going over the handle bars that I probably acquired in my childhood. The beauty of these trails is a rather compelling argument to invest in a mountain bike, however.